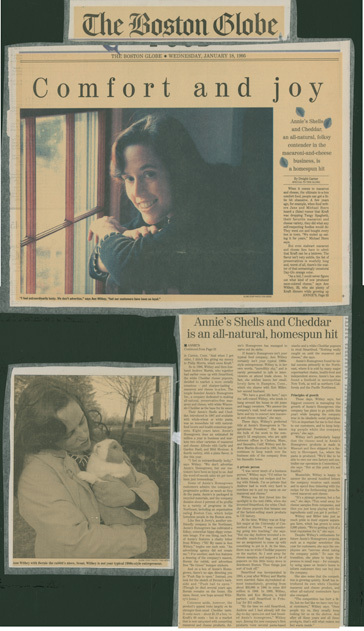 Annie's Inc. is a rapidly growing natural and organic food company with a widely recognized brand, offering consumers great-tasting products. Annie’s loyal consumer following has enabled them to grow to a brand sold across the mainstream grocery and natural retailer markets. 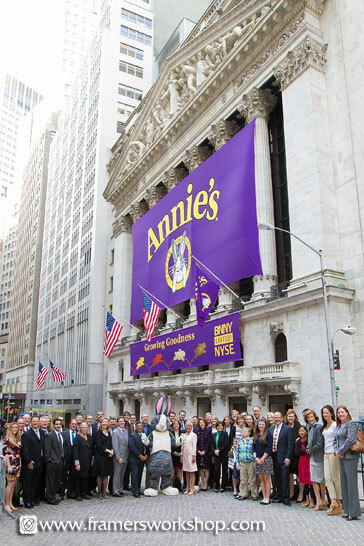 Annie’s is mission-driven and committed to operating in a socially responsible and environmentally sustainable manner, with an open and honest corporate culture. 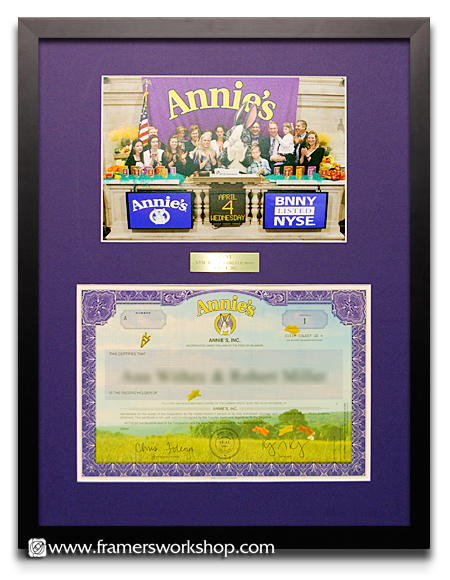 When Annie's Inc. went public with thier highly successful IPO, they called on us to help them put together a surprise commemorative gift to be given at thier first shareholders meeting a week later. 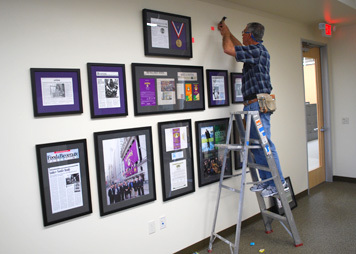 Within that week we made multiple visits to Annie's to help them with the framing of newspaper articles, IPO booklets, stock certificates and promotional photographs with brass plaques. 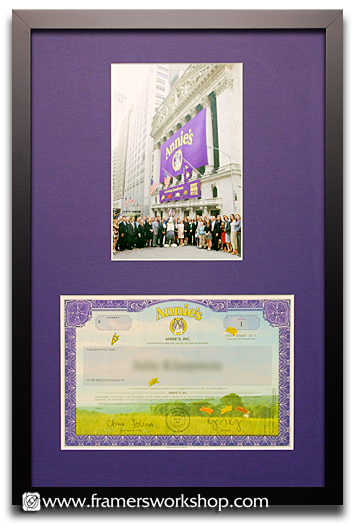 Rather than frame original certificates, we created personalized replica certificates and reproduced photos from the New York Stock Exchange closing bell event. When we have a rush job on this scale, we frame in high gear. 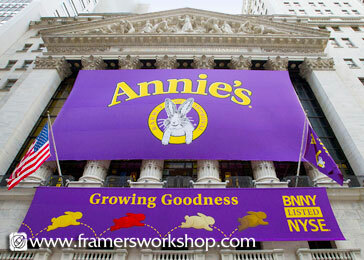 Our vendor overnighted brass plaques, and our framing suppliers rushed materials to us. 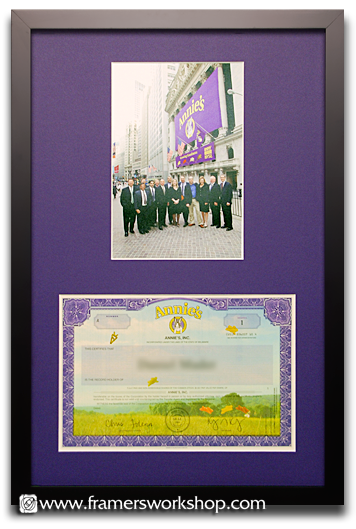 Our graphics manager worked overtime to produce the over four dozen replica certificates and accompanying photographs. 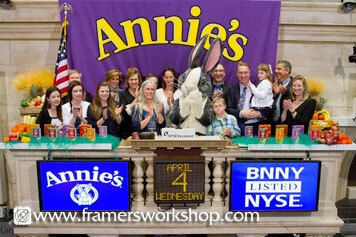 Our custom framers came in on Sunday morning to set up production. 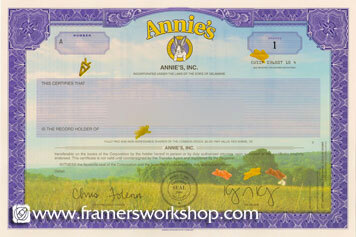 By the morning of the shareholders meeting at Annie's Berkeley headquarters, we delivered the individually wrapped certificates. 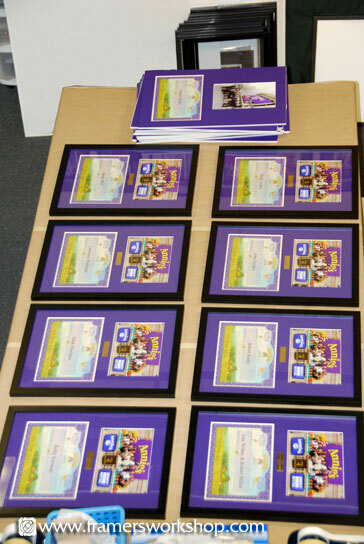 We shipped the remaining framed gifts to those who could not attend. Working with Annie's was a real pleasure because they were highly organized and communicative throughout the project process, making our job much easier. 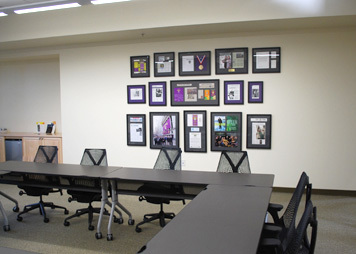 We also helped Annie's create a memory wall for their new conference room. 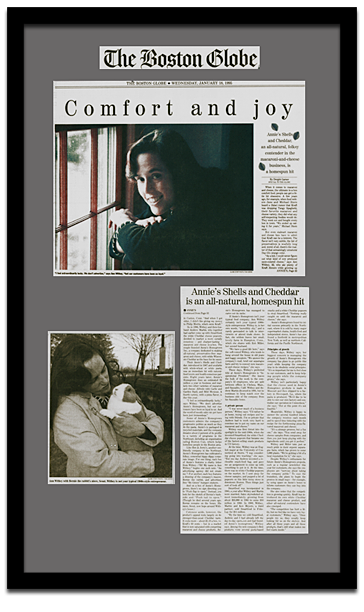 Part of this project involved scanning old discolored newspaper and magazine articles (right) and digitally restoring them for the new presentation. Kirstie views a possible wall layout on the floor before installation. 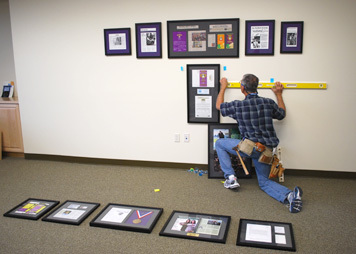 The challenge on this job was to create a layout that has room to grow as new articles are added. 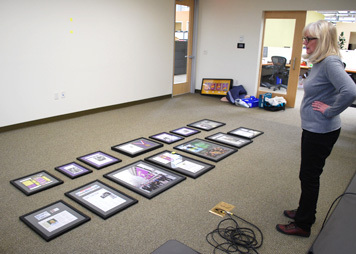 We also previewed shadowbox layouts using our visualization system (below, right). 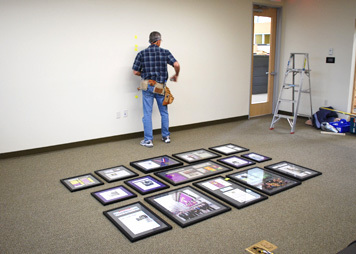 This way our client was able to approve designs before we began framing. 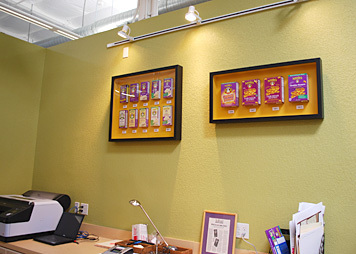 Food package boxes hang above the package design work area. 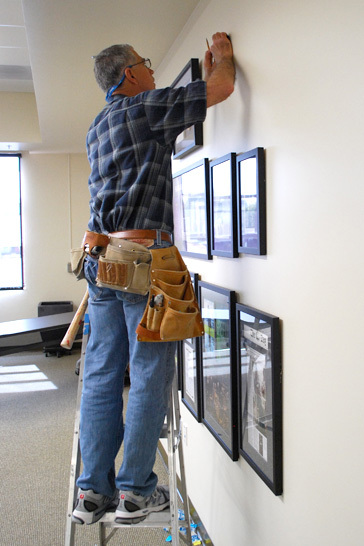 Frames are hung high to allow for activities on the cabinet below.